Video: Talks At Google: Neel Doshi & Lindsay McGregor: "Primed to Perform". Video: Vega Factor Speaking Reel: Neel Doshi. 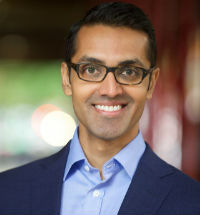 Neel Doshi is the co-author of New York Times bestselling book, Primed to Perform: How to Build the Highest Performing Cultures Through the Science of Total Motivation, and co-founder of Vega Factor, a startup building technology to help organizations transform their cultures. Too often, great cultures feel like magic. While most leaders believe culture is critical to success, few know how to build one, or sustain it over time. Primed to Perform (Harper Business) explains the counterintuitive science behind great cultures, building on over a century of academic thinking. It shares the simple, highly predictive new measurement tool—the Total Motivation (ToMo) Factor—that enables you to measure the strength of your culture, and track improvements over time. It explores the authors’ original research into how total motivation leads to higher performance in iconic companies, from Apple to Starbucks to Southwest Airlines. Most importantly, it teaches you to build great cultures, using a systematic and sustainable approach. Whether you’re a five-person team or a startup, a school, a nonprofit or a mega-institution, Primed to Perform shows you how. Doshi studied engineering at MIT and received his MBA from Wharton. He was previously a partner at McKinsey & Company, CTO and founding member of an award-winning tech startup, and employee of several mega-institutions. In his spare time, Doshi is an avid yet mediocre woodworker and photographer. He currently resides in New York. "Neel has done a number of talks for our organization from intimate discussions with a handful of our senior executives to large groups of hundreds for our front line leaders. In every case he has been incredibly interesting, detailed, practical, inspirational, and funny! Whenever we schedule one of Neel's sessions, the program sells out in minutes. I couldn't recommend him more." "In Primed to Perform, Neel Doshi and Lindsay McGregor have an important message that more managers need to hear and understand. Their system of understanding how teams work, and how they can be positively motivated is thought provoking. We thoroughly enjoyed having them as part of the Talks At Google program." "Neel is a rare talent in the business world. I work with many consultants, and very few can weave together hard science, real practical recommendations, and a compelling story, like Neel has. In my organization's own leadership forums and conferences, I've seen many leadership and culture experts speak. Neel is unique and impactful in this space. First, his approach is based on hard science, something I have literally never seen before. Second, he has a lot of business experience, and makes his recommendations practical and nuanced. Third, he happens to be a gifted communicator. He really knows how to command a room. I have no doubt that his and Lindsay's book will be an amazing success. We look forward to the book release, and getting Neel to share his thoughts with our clients and colleagues at New Profit." "A fresh, ambitious look at the science and practice of motivation, with big implications for leaders to fuel high-performing, high-energy cultures. Primed to Perform is an excellent companion to Drive." "A grand tour of the science of culture, filled with awe-inspiring experiments and surprising, real-life case studies. Smart, deeply researched, and incredibly practical, leaders will turn to this book again and again whether they’re building an organization from scratch or transforming an established company." "Getting organizational culture right is as difficult as it is critical. Doshi and McGregor provide numerous real-world recommendations for how to do this. They bring to bear years of hands-on experience that will prove invaluable to leaders in all sectors-corporate, non-profit, and public." 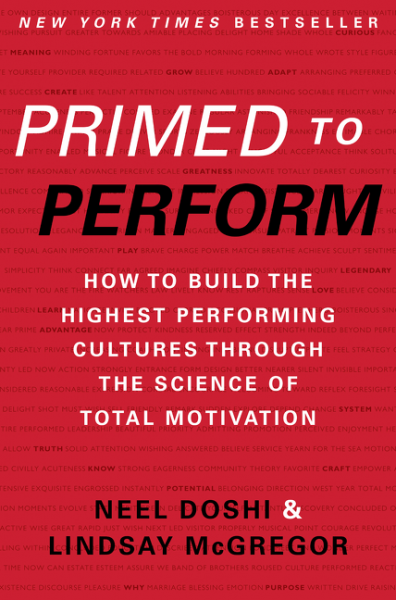 "Primed to Perform doesn’t just provide tactics for motivating a few superstars; it offers a proven system for motivating an entire workforce. If you want to get your team off yesteryear’s career ladders and onto new learning curves--stretching, growing and contributing at their best--read this book." "A winning strategy requires a winning organizational culture to carry it forward. In Primed to Perform former McKinsey consultants Neel Doshi and Lindsay McGregor give us practical guidance and proven practices to effectively transform our organizations through the science of motivation and performance." "This book is loaded with fascinating, thought-provoking and actionable advice that could transform a workplace from drudgery to real engagement. Take notes."